When I travel to Washington D.C. for work I am always torn over which friends to visit. I am fortunate to have about a half a dozen who live there, yet I never have enough time to see them all though I would like to. This time I simplified things by hiding from my D.C. friends and inviting Laura to join me from Pennsylvania for the weekend. Laura is the kind of friend who buys you The Art of Vintage DC Comics postcard set, because she knows you will squeal when you see it. She arrived on Friday night and as we watched her beloved Kansas City Royals win a playoff game she mentioned that she had never visited the Lincoln Memorial. She has been to D.C. many times, even lived there for a summer yet never found the time to pay her respects to our greatest president. Such a confession made me question Laura’s patriotism since visiting D.C. and skipping the Lincoln is unthinkable to me. The next night we opted for an organic dinner at Founding Farmers near the Foggy Bottom Metro stop. We arrived at the restaurant at 7:00 PM, gave the hostess our name and she promised us an hour and half wait. We ran to Whole Foods where Laura appeased her hunger with a $40.00 bag of almonds. This particular Whole Foods, located at 23rd and I Street doubles as a college dining hall for the well-heeled students of George Washington University. We then walked briskly down 23rd past the State Department on one side of the street and the US Institute of Peace on the other. 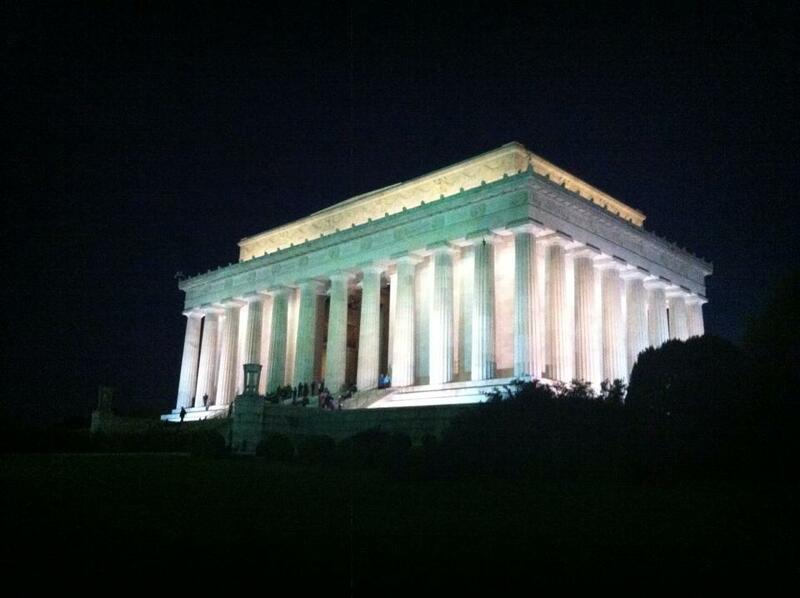 It was dark by this time so when the Temple of Lincoln emerged in the distance it looked more hallowed than ever. We climbed the 57 steps to the top of the monument and joined the throng of worshippers. To my great annoyance most of these picture snappers ignored the “quiet please” signs, speaking loudly and missing the reverence of this place. 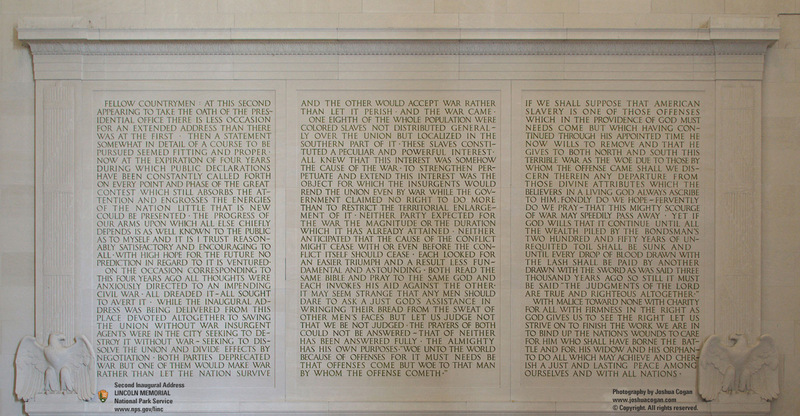 Some took the time to read the Gettysburg Address on one wall and Lincoln’s beautifully succinct and poignant Second Inaugural on the other. Those of us who have seen Spielberg’s Lincoln and skimmed Goodwin’s Team of Rivals know that Abraham Lincoln knew how to put pen to paper and tell a good story. His Second Inaugural Address encompasses both of these skills. When reading this document, “With malice toward none, with charity for all” jumps off the page or the wall in this case. We prefer to think about the forgiving and hopeful Lincoln who wanted “to bind up the nation’s wounds,” near the end of the Civil War. Doing so allows us to skip over the horrors of slavery and avoid the difficult unresolved questions that came with Reconstruction. Few people remember the following passage, one which reveals Lincoln’s perception of American chattel slavery. After his own battle to understand the nation’s “fiery trial” Lincoln concluded that slavery needed to end one way or another no matter the cost. After attempting to take photos with my deficient camera I took my usual position outside under the portico sitting just a little to the left where I could stare nostalgically across the reflecting pool past the Washington monument at the Capitol. I remembered all of the many visits I have made to this city – as a child with my mother, brother and father who loved the museums and feared the beltway traffic, again in high school to visit my first boyfriend, in 1992 with college suitemates for Bill Clinton’s first inauguration, years later for dissertation research during a hot July and again for job interviews in bitterly cold January, followed by yearly conferences and meetings ever since. Each time I visit whichever monuments I can fit into my schedule whether they be the overdone FDR, the moving Vietnam wall, or the always-better-at-night Korean War Memorial. Recently I added the bold new Martin Luther King, Jr. monument to my tour. MLK looks across the Tidal Basin at Batman (Thomas Jefferson for the uninitiated) and I imagine them holding a silent conversation. Both intellectuals they would have gotten along well, with one man having the courage to claim what the other hoped for yet could not conceive – true freedom for African Americans. Jefferson resides off the beaten path in his rotunda so I only see him every third or fourth visit. I have never missed calling on Mr. Lincoln, though last year the government Shut Down confined me to street level viewing. Visiting D.C. and skipping the Lincoln Memorial would be akin to travelling to the ocean and not taking the time to walk barefoot through the sand – inconceivable (insert your own Vizzini reference here). 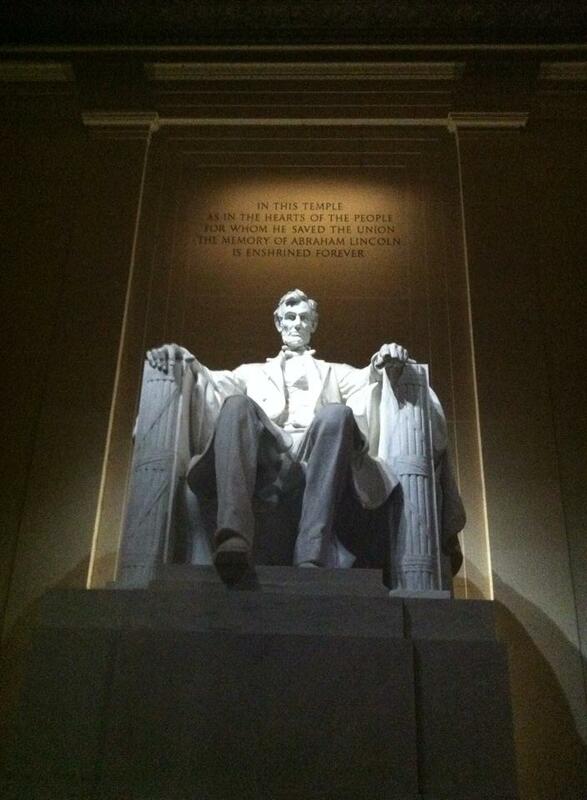 Much to my relief Laura loved seeing the Lincoln at night; she remarked on the thin crowds and the inviting space. We spent about 30 minutes at the monument admiring the view and taking requisite selfies. We hiked back up 23rd in about ten minutes, making it to Founding Farmers in time to enjoy its delicious reasonably-priced cuisine. We shared appetizers of deviled eggs, and farmer’s bread layered with brie, apples and onion jam. Then we savored crab cake and whipped red potatoes and shrimp and grits. We lamented missing the MLK and the FDR, but promised to see them next time. When my plane took off from Washington National Airport the next morning I looked down and smiled as the Jefferson Memorial appeared beneath me followed a second later by the Lincoln. I enjoyed an “all’s right with the world” sensation while I said goodbye to these old friends and recalled the past few days roaming the city with Laura. It was time to return home to work, family, and the fall TV lineup. As the plane hit a little turbulence I crossed my fingers, hoping that we would not take a nose dive into the Potomac. I could not imagine missing Oliver and Felicity’s first date on Arrow, that other DC property. Talk about unthinkable. Travel	Arrow, Founding Farmers, Lincoln Memorial, Washington D.C.